From ancient to modern times stadiums have had a common design; reflected in similarities in shape, structural elements, materials, and methods of construction. The earliest designs were by the Greeks starting in the 8th century BC and were improved by the Romans during the first 4 centuries AD. The colosseum (to the left), the Roman’s most acclaimed amphitheater, is regarded as the mother of all ancient stadiums, setting the standard for innovative design and construction. Roman stadiums inspired the evolution of their successors to the level of beauty and sophistication of today. 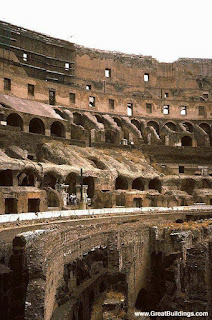 The giant amphitheater built in Rome in the first century AD is known as the Colosseum. 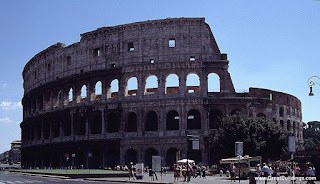 The Colosseum is a vast ellipse with tiers of seating for 50,000 spectators around a central elliptical arena. The three tiers (to the right) include Doric features on the first story, Ionic styles on the second, and Corinthian styles on the third. Above them is an attic story with Corinthian pilasters and small square window openings in alternate bays. The construction utilized a careful combination of concrete for the foundation, travertine for the piers and arcades, tufa infill between piers for the walls of the lower two levels, and brick-faced concrete used for the upper levels and for most of the vaults. After the fall of Rome, amphitheaters survived for some time until the decline of Roman cities themselves terminated the spectacles that they had once held. Nearly two millennia passed before the construction of amphitheaters was revived via much smaller, usually temporary stands used for spectator events such as the knightly tournaments during the Middle Ages in Europe. The shapes of stadiums have varied widely according to the variety of uses for which they were built. Some are rectangular with curved corners, whereas others are elliptical or U-shaped. The building of large stadiums in the 20th century has been greatly facilitated by the use of reinforced concrete; this material has made possible the construction of daring new designs that would previously have been impossible to sustain structurally. A basic difficulty of building roofed stadiums is the interference with visibility created by the columns supporting the roof. 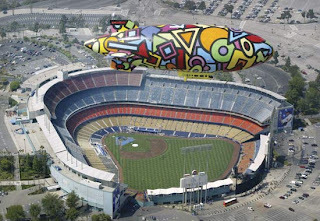 Dodger Stadium (to the left) in Los Angeles was the first tiered stadium to provide column-free views from all seats (1959), followed by Shea Stadium in New York, which added field seat sections that rotate around the stadium to permit conversion from a baseball to a football appropriate arrangement (1964). Several other outstanding stadiums have been built for baseball, for example, Busch Memorial Stadium, St. Louis, Missouri, and Atlanta Stadium, Atlanta, Georgia. A significant development of the mid 20th century was the Astrodome (to the right), built in Houston, Texas; this was the first major fully roofed stadium. Indoor stadiums of considerable size had been built previously, notably Madison Square Garden in New York City (1890), and Chicago Stadium, Chicago (1928), capable of seating 17,500 (both original structures have been demolished). 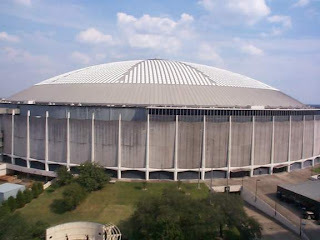 The Astrodome was gigantic, with a seating capacity of 62,000 people and a large playing field. The dome, of transparent plastic panels supported by a steel lattice, has a span of 642 feet and rises 208 feet above t he playing field. The entire interior is air-conditioned. 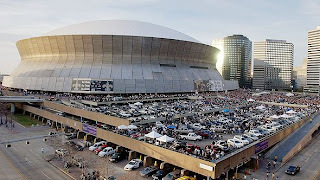 Within a decade, however, the Astrodome was eclipsed by the New Orleans Superdome (to the left), which has an official seating capacity of 69,065 (though able to accommodate larger numbers); the 30-story structure is topped by a steel-ribbed roof that has a 680-foot clearspan. In the late 1980s, stadiums with retractable domes began to appear; most notably Toronto’s SkyDome (opened 1989). 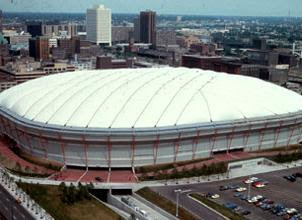 An important development in stadium design was the application of flexible steel cables to span large roof dimensions. Cables contributed significantly to the speed of construction, the lightness of roof, and the reduction of construction costs for covered stadiums. A modern stadium with this system was built in Minneapolis–St. Paul, Minnesota, and called the Metrodome (to the right). Such cable systems can span large distances; a concept for a 200,000-capacity, covered baseball stadium was developed by Lev Zetlin, an American engineer. The design for enclosed stadiums and with greater capacities has led to the search for improved materials and construction techniques. Modern technology, including that developed in the aerospace industry, already includes techniques for covering spans of thousands of feet. It is by no means unrealistic to see today’s roofed stadiums, with their arrays of restaurants, exhibition halls, and other auxiliaries, as the forerunners of completely roofed, weather-controlled cities. Within the last 10 years, there has been an array of state of the art stadiums around the world that all have roots leading back to the ancient stadiums of the Roman Empire. There are still some mystery in this historical place.